Women, particularly those in developing communities who gather fuel and water, tend to fields, and care for children and the elderly, are especially impacted by climate change. The women featured in Mothers of Invention show how women are turning the challenges of climate change into opportunities to be leaders in their communities. 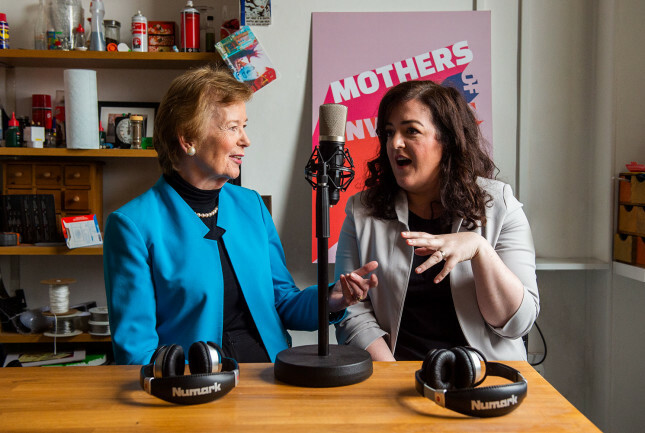 In the first episode of Mothers of Invention, Mary and Maeve sat down with women from around the world who are leading legal fights on climate. Marjan Minnesma organized the world’s first climate liability lawsuit in the Netherlands. In 2015, the Dutch courts found that the Netherlands is responsible for cutting emissions to protect its citizens from climate change. After hearing about this case, Tessa Khan has been working to bring similar cases to court through the Climate Litigation Network. The hosts talk to three young women, Kelsey Juliana and Victoria Barrett from the United States and Ridhima Pandey from India, who are all involved in similar cases in their home countries. The second episode features an equally diverse and accomplished group of women. Yvette Abrahams started as an anti-apartheid activist in South Africa, and has turned her energy to climate justice, gender rights, food security, and more. May Boeve, meanwhile, is the Executive Director of 350.org, an international grassroots organization. Finally, they speak with Tara Houska of the Couchiching First Nation, who is an attorney and National Campaigns Director for Honor the Earth. To listen to more, see the Mothers of Invention website or subscribe to the podcast with the podcast player of your choice. Photo courtesy of Mothers of Invention. See their Press page for more.